STEP 1: Blend together dates and almonds and spread at the bottom of a parchment paper lined 6 inch round pan. Set aside. STEP 2: Blend bananas, cashews, cacao powder and maple syrup together until a smooth texture is reached. Pour mixture into pan and place in the freezer for 8 hours or overnight. STEP 3: Mix together 1/4 cup coconut oil, 1/4 cup cacao powder, and 2 tablespoons maple syrup. Pour enough chocolate to cover the bottom of the lined mini cupcake pans. Set in the freezer for 10 minutes to set up. Remove and spoon a small amount of peanut butter in the middle of the cups. Pour the rest of the chocolate over top of the peanut butter to cover completely. Place in the freezer for 20-30 minutes to set up. STEP 4: Once everything is completed, remove the cheesecake and peanut butter cups from the freezer. 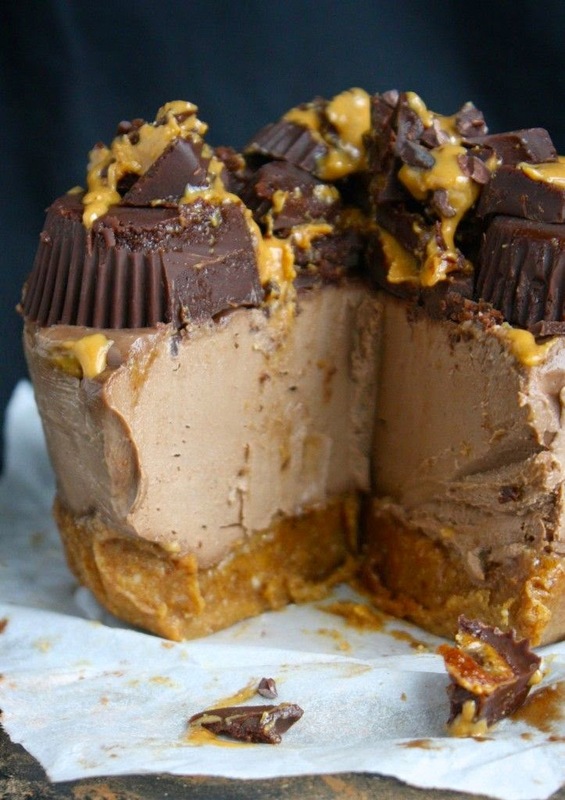 Place the peanut butter cups on top of the cheesecake however you’d like. I used 6 of the peanut butter cups for a top layer and then chopped the rest and put them on top. Drizzle more peanut butter on top if desired.